When installing a patio, you have a lot of things to think about in order to ensure you get exactly what you want and need. For instance, you have to take multiple things into consideration, such as color, texture, and style. What will you use your patio for? How much furniture will you want on it? Will you use it for personal enjoyment only or for entertaining friends? All of these things affect the size and type of patio you end up with. 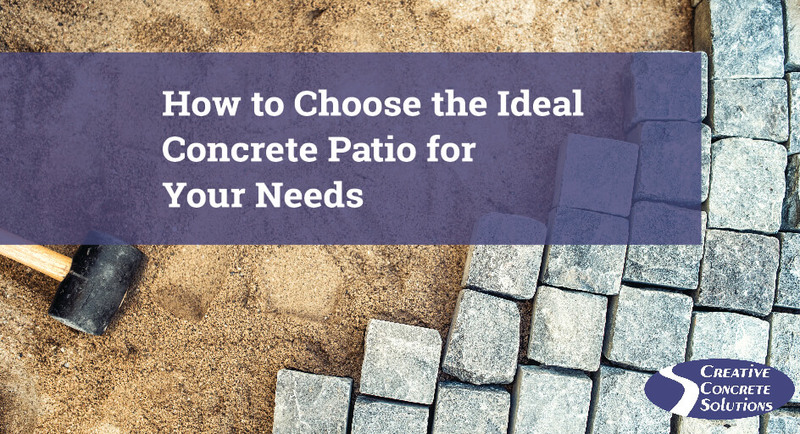 To make sure you choose the best concrete patio for your home, take a look at these four types of patios, along with your color and style options for the concrete. A popular patio choice is the living room patio, which functions as your indoor living room would, but outside. This means it would include outdoor versions of sofas, lounge chairs, coffee tables, a fireplace, and anything else you’d want for your living room that can function outside. To create a cozy atmosphere, many outdoor living room patios will also include wall seating, water features, and a fire pit. When thinking about what all you will decorate your living room patio with, consider including enough room for people to move about the patio, as well as include a focal point for conversation. To shield the patio from rain or harsh sun, include a gazebo or pergola over top, supported by decorative pillars. If you are short on space but still want a cozy outdoor patio area, consider a bistro patio that is typically sized for a small table and a couple of chairs. It should be large enough to function but small enough to fit the available space. Another popular concrete patio choice is intended for outdoor dining. These can either be rounded or rectangular and are dedicated to containing a patio table and chairs. It’s different from the bistro patio in that a dining patio can seat a whole family or group of friends rather than just a few people. Just plan to space your patio according to how many you would anticipate having for a meal outdoors. A sundeck patio can either be for lounge chairs to suntan on or can be an addition to a swimming pool deck. For these patios, you will want to consider how many lounge chairs you will have, the size of those chairs, and how much walking space you’ll want to include between those chairs and the pool to avoid any unintentional slips into the water. Once you decide what sort of patio you will want for your home, you can start thinking about how you will want the concrete to look in color and style. Remember, concrete doesn’t have to look like concrete. It can be colored, have designs on it, or look like a number of other materials. Most people tend to choose neutral colors that will that blend in with their home and landscape. These colors can include brown, gray, tan, charcoal, Spanish clay, or natural concrete color. If you choose to use multiple colors, you can also create art designs or patterns such as floral patterns, a grid, or interior tile floor design. With a material as versatile as concrete, you can make it look like just about anything you want it to look like with the use of staining and stamping. By staining concrete, you can enhance your concrete with color, patterns, or a bold design. You can choose to include a stained border along the edges or mimic materials like natural stone, wood, marble, or tile. With the right combination of staining and stamping methods, concrete can provide the perfect transition from the indoors to the outdoors. Plus, it’s a cheaper alternative to expensive patio materials as listed above.